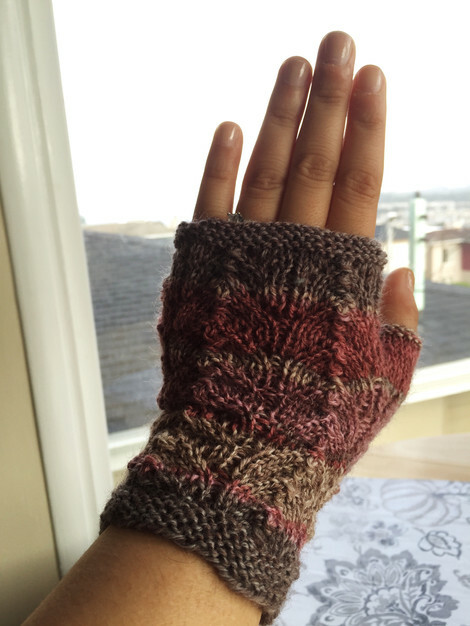 Just a quick post to share a pair of mitts I knitted up for my sister’s birthday. She’s just transferred to UCSB and I’m pretty sure she will need something to keep her hands warm while studying in the coming months. I used the Cranford Mitts pattern, though really it’s just a basic horseshoe lace pattern in a tube with a simple thumb gusset. I’m looking forward to making this pattern again using other Shetland lace patterns, I love old-fashioned knitted lace! I used Paton Kroy self-striping sock yarn. The yarn was nice to use, and I almost matched the two mitts. Close enough, anyway! 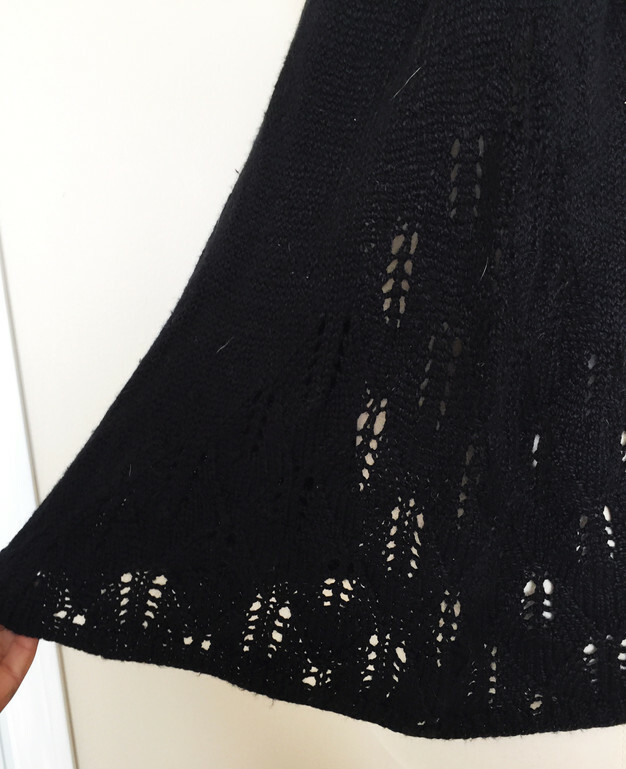 It turns out trying to take photos of a drapey, black sweater on a dress form is pretty much an exercise in futility. This is my third real sweater, and I love it. 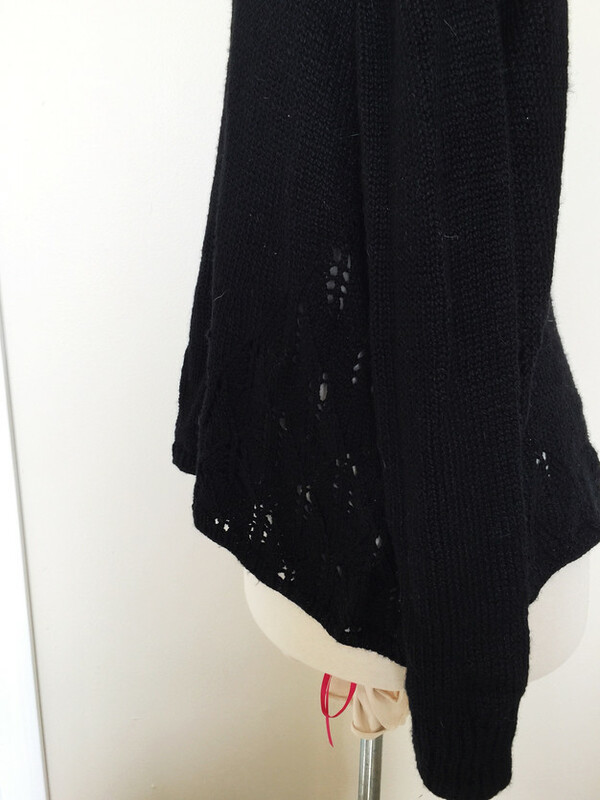 It’s the Princess Fiona pattern by Amy Miller, a boxy sweater with slim fitting arms and a lace panel on the side. I loved making it and wearing it! I used the Galileo yarn from Knit Picks, and it was perfect for this project. It results in a very soft, drapey fabric. 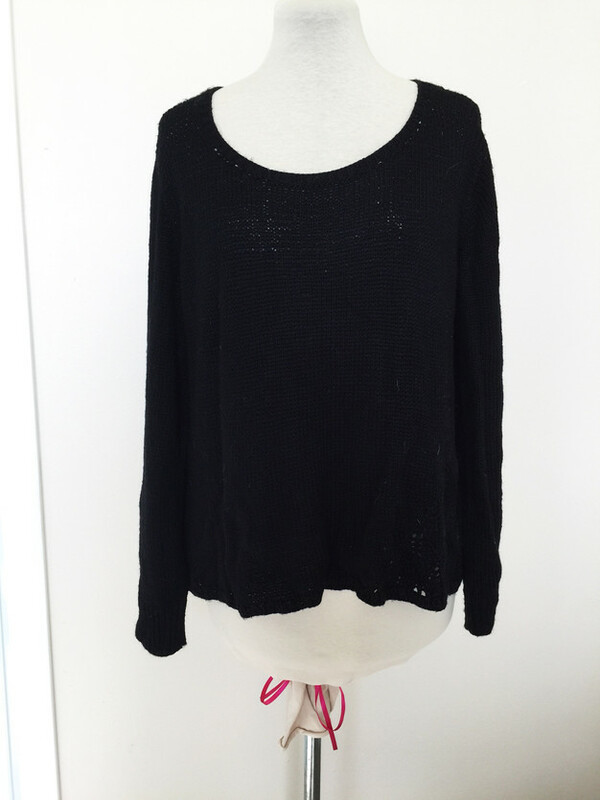 Perfect for this sweater, but not for everything. That’s as good as it gets! You just have to trust that this sweater looks good on. Being in black, the lace pattern doesn’t show up too well in person either, but I think it adds just the right amount of interest to one of my favorite things to wear. A big storm blew through last night, so we went to the beach to enjoy the cold, but very clear, day today. I knit this little headband with a giant flower a little while back, and even though it’s kind of silly I just love it! Pattern is American Beauty Rose Headband on Ravelry. Mitts are also made by me, and scarf is made by mom. This post comes courtesy of Dandelion, who decided to take a nap in my lap just as I finished up the waistband of a nearly finished Moss skirt. I really want to try it on, but I guess I can spend some time online while he gets his rest… Hope you’re all having a wonderful weekend! It has been windy here in the bay area! We’ve had two nights in the last couple weeks where the wind was howling off the ocean at 40-50 miles per hour with gusts even faster, which is enough to shake the walls and leave me feeling pretty unsettled, and most other days have been blustery as well. I like to wear a hat when it’s windy to keep my hair contained and my ears warm, and this easy, slouchy hat might just be the most perfect hat ever! I used the free Striped and Slouchy Hat pattern on Ravelry, and I would highly recommend it. It’s a nice size – big enough to neatly hide a low bun and not smash hair too much, but not super big – and I like the look and weight of the gathered top. The best thing about the pattern, though, is the sixteen rows of ribbing at the edge that keep the hat on through all sorts of inclement weather. I used leftover balls of wool-ease, and despite my frustration with that yarn lately it worked really well with this hat. It’s a keeper! Spring is probably my favorite season. I love the new flowers coming up, the first few warm days, the way everything feels so fresh and new. This is my first spring in a climate where the seasons aren’t so obvious, but even here by the ocean I’ve spotted new wildflowers and grass. We’ve also had a lot more chilly fog in the last few weeks than through the winter – signs of summer? To celebrate spring I brought some daffodils home. They brighten the whole house! I recently finished a pair of spring-inspired mitts as well. I absolutely love fingerless mitts and wear them constantly. It’s amazing how much warmer you feel when the backs of your hands are covered! 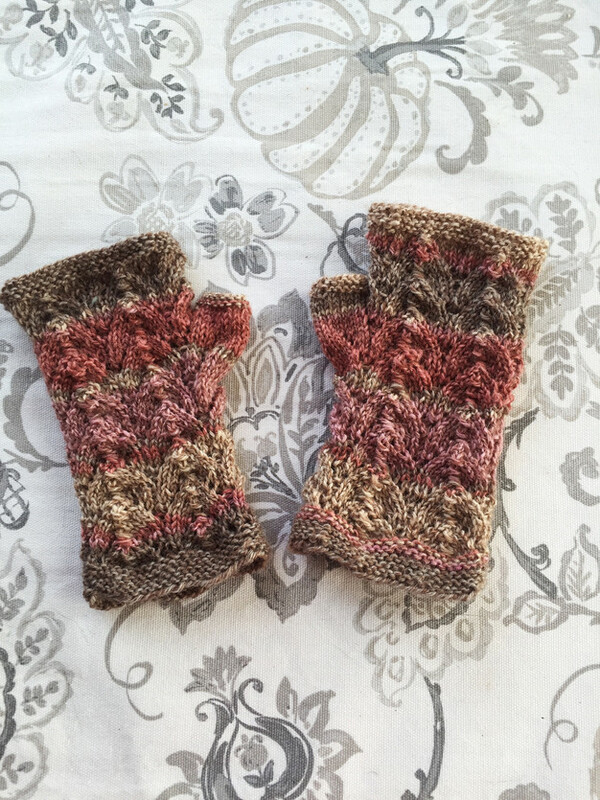 I used the Vineyard Lace Mitts pattern, free on Ravelry (my project is here). It was a fun pattern to knit up, and I love the leafy lace. No alterations besides making the mitts shorter for use while typing. I used Lion Brand Vanna’s Choice yarn for the first time, and I actually liked knitting with it! I tend to avoid 100% acrylic yarns, but it doesn’t have that plastic shine and seems to be holding up pretty well. I have been having lots of trouble with big stitches at the intersection of the double pointed needles, no matter how tight I pull, but didn’t have trouble at all with this yarn. Thinking about it, I haven’t really had trouble with any yarn except Wool-Ease, which tends to be my most-used yarn due to availability and budget. Has anyone else had problems with Wool-Ease? Any suggestions for a relatively inexpensive yarn that you have had good results with?